Richard Nixon research papers give a biography of the former President and write of the Watergate Scandal. Paper Masters has political science writer that will custom write a research paper on any aspect of Richard Nixon you need covered. Nixon was a very controversial president and our writer will focus on any aspect of his life, presidency, Watergate or Nixon's politics. Even today, nearly thirty years after his presidency ended, Richard M. Nixon is viewed as a bad president by many Americans. In a 2000 survey of 78 presidential scholars, Nixon ranked 33 out of 40 presidents rated. At the time of his resignation as a result of the Watergate Scandal, some of his aides assured him that history would be kind to him. Nixon himself spent many of his remaining twenty years trying to reshape his image. 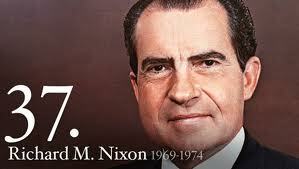 Despite his many successes, Nixon is still tainted by Watergate and has not been rehabilitated yet. He may never be. But there are many reasons to contend that Nixon was a successful president and would have been viewed as such if not for Watergate. Nixon had momentous foreign policy successes and visionary domestic policy accomplishments long sought by his predecessors. An unbiased examination of Nixon’s record shows that his administration was one of the most successful of the twentieth century. Any president would be proud of those accomplishments. They do not erase Watergate, but they certainly mitigate it. Watergate and Richard Nixon - This is a political science research paper on Watergate and President Richard Nixon. Gerald Ford - Gerald Ford research papers examine the 38th President of the United States who succeeded Richard Nixon in August 1974. Environmental Protection Agency - It was created in 1970 by executive order of President Richard Nixon. While it is not a Cabinet department, its administrator is nominally accorded cabinet rank. Henry Kissinger research papers look at the American diplomat who served as National Security Advisor and Secretary of State under President Richard Nixon. Paper Masters writes custom research papers on Richard Nixon and give a biography of the former President and write of the Watergate Scandal.